Africa is a massive continent. But for whatever reason, map makers make it appear smaller than its “true true” size. As Polish-American scientist Alfred Korzybski reminds us, “the map is not the territory.” Lines are ultimately arbitrary. Map design is deceptive. But computer-graphics designer Ka Kraise took it upon himself to ‘fight against rampant immappancy,’ in particular the popular Mercator projection originated by Gerardus Mercator in 1569 which tends to exaggerate the size of continents and countries more than others. Greenland, for instance, is 14 times larger than Africa. 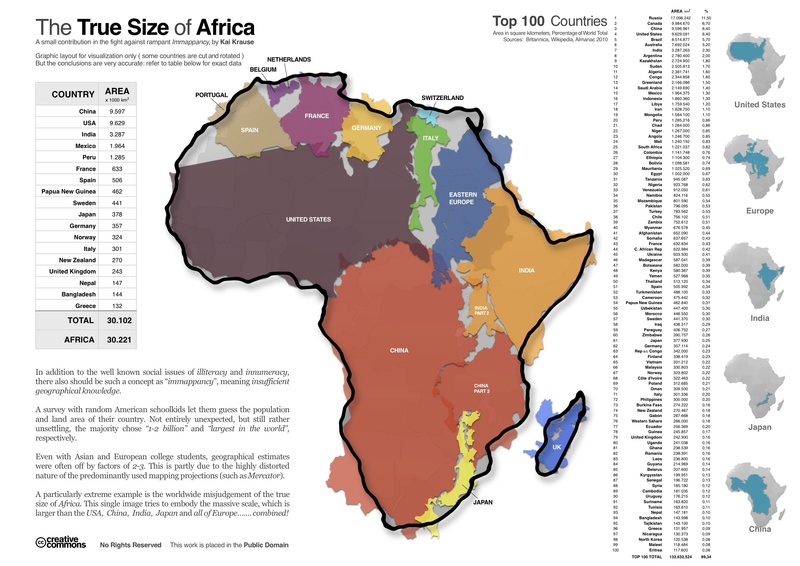 As you can see above, Kraise illustrates the reality of Africa’s size, that which is “larger than the USA, China, Japan, and all of Europe, combined!” The Economist revisualized Kraise’s map as well. Kudos to Kraise for illuminating our ignorance about geographical knowledge, pointing the finger at Western and Asian students who tend to inflate the size of their countries when in actuality Africa makes everyone else look so small.